This is the back of David Greenspan, who started Butcher Shop Press in 1999 after running Oneonta State College's literary and art journal for several years. David told me, "The first time I ever used the butcher image was in a poem I wrote in high school called 'an American Dream.' " He added, "the line read no more sour looks for the butcher, no more time to stop and chew the fat." 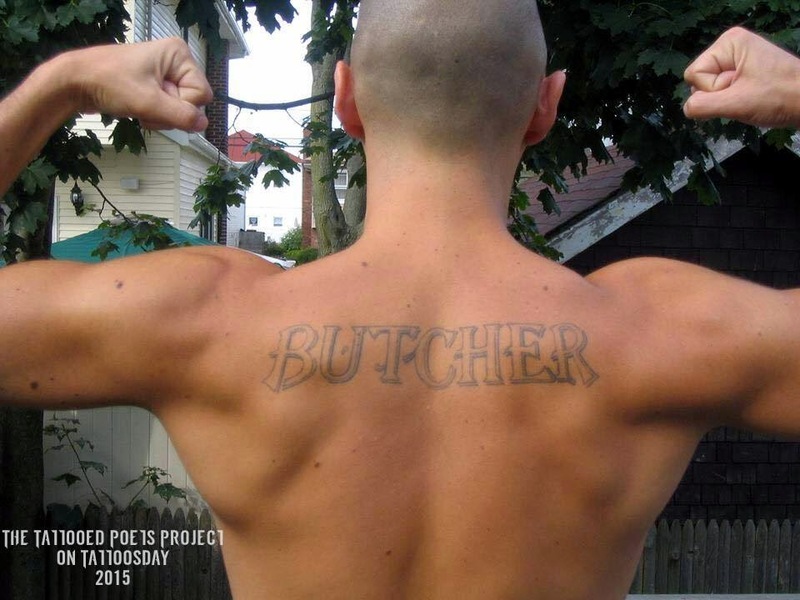 He also sent us the following poem, "The Butcher Shop," which he composed "a few years later while sitting in an American poetry class:"
and I don’t have the two dollars to buy a new one. only to find my sweater’s wearing thin. or out as I lift my pen and cut the butcher in half. And he asks why would I ever do a thing like that? tired of these idiosyncratic idiots all laughing at their own jokes. I’m tired of constipated poetry, It must stop! I’m full. Exhausted. Breathing heavier than last night’s romp. . . Thanks to David for sharing his poem and tattoo with us here on Tattoosday!